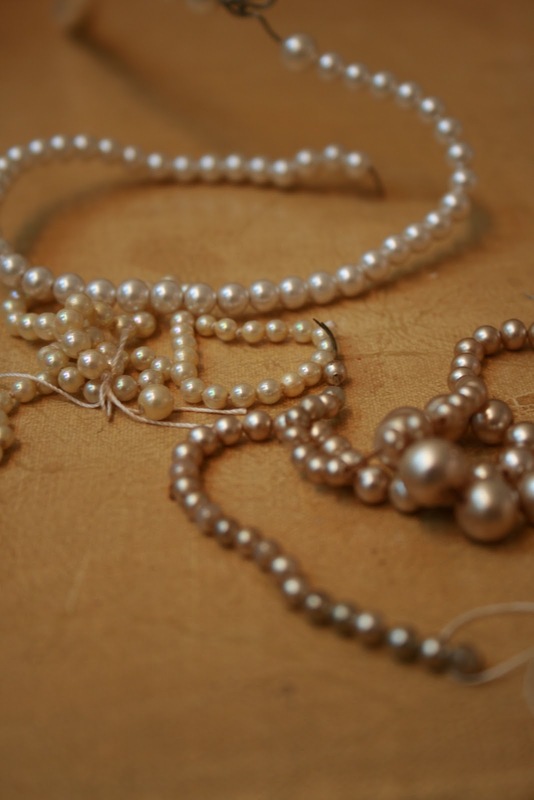 a woman's wardrobe isn't complete without a sweet string of pearls. Me? I collect them from thrift stores and estate sales. Marie Antoinette wore the real thing, but Coco knew a fake can be just as glamorous. So, I pick them up, but they are coming unstrung, they have no clasps, they have been abandoned. They are often not quite as long as they need to be. breathtaking, inexpensive and really, quite quick handmade gift. 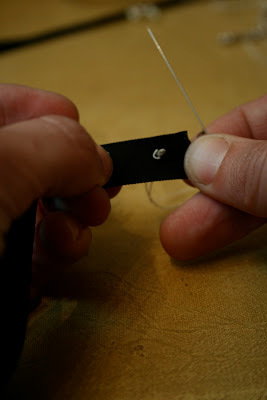 Step 1: Thread needle with buttonhole thread, doubled. about 1 inch from the end, centered widthwise. Draw tight against the back of the ribbon. 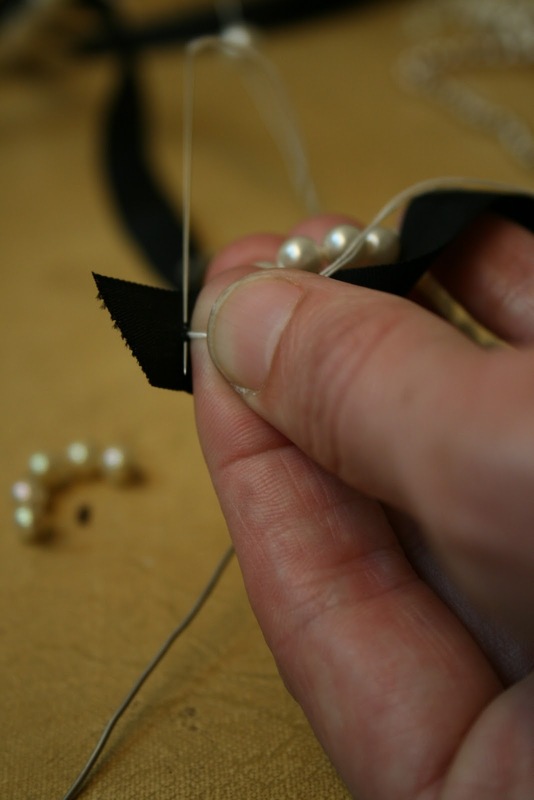 Load up the needle with pearls. Pull all the way through so the pearls rest snuggly against the ribbon. Repeat until all the pearls are strung. about one ribbon width from the from the end. This part is actually the trickiest part. make a tiny stitch to start to create your knot. Now push your needle through the stitch and then slowly pull the thread to really secure the ribbon against the pearl. 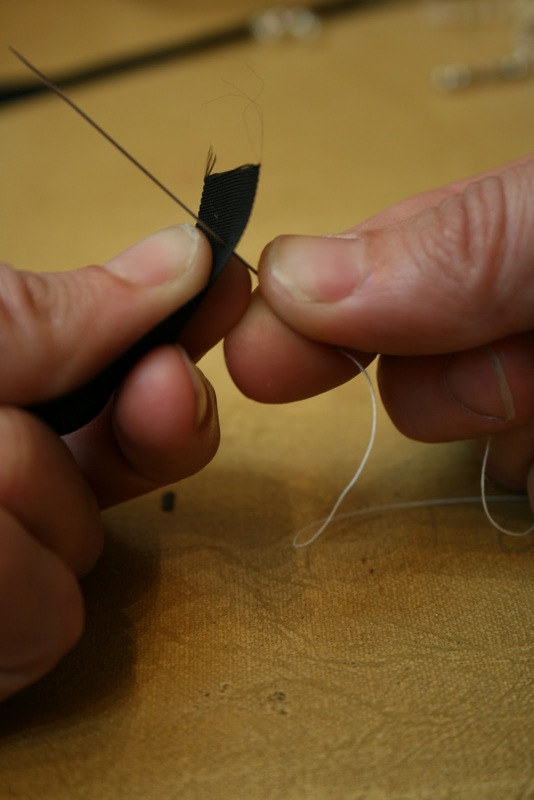 I held the ribbon and needle in one hand and pulled the thread through the knot with the other. If you aren't careful you will have unattractive thread slack. Tie off firmly and trim extra thread. Thread needle with the regular thread in the same color as your ribbon. Fold the ribbon over the knot by taking the close end and folding it at a 45 degree angle across the knot first down toward you and the up toward the top to create a point over the knot. 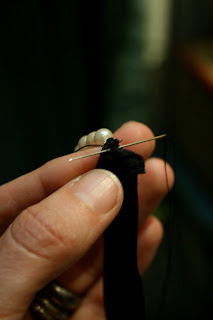 Stitch it in place, and all along the open side of the fold. Trim any ribbon tail that sticks out of the bottom of the fold on the back side. And Viola: Simple, Elegant... Utterly giftworthy! for those stockings that need stuffing! I just really like your posts. I want to string pearls now! 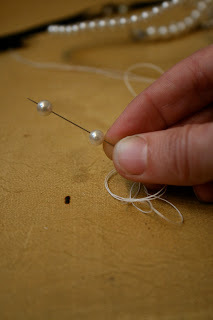 I have a couple of those fragile-threaded strands... looking for them now. The ribbon adds such a fantastic touch! Stunning. Thanks for the tutorial.I think I like the velvet with the pearls rather then the pearls alone,really feminine,classy, a much more updated look. So gorgeous. 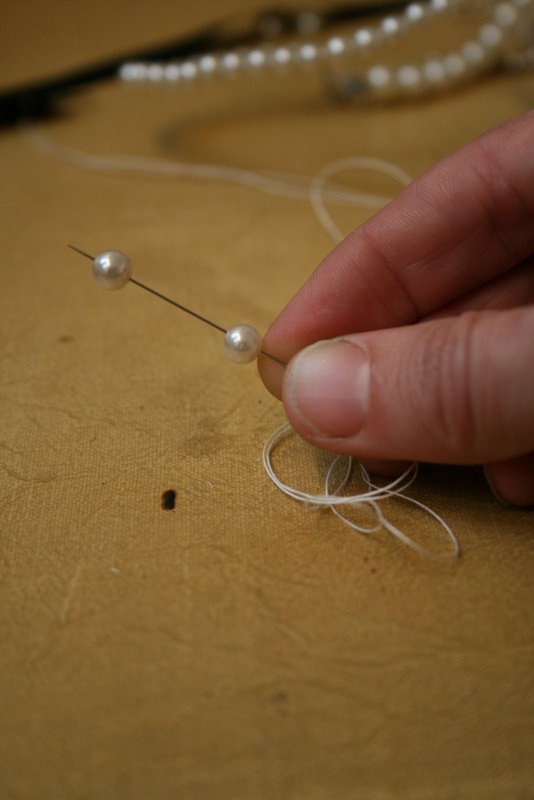 I totally got hooked knotting pearls/beads this summer. It's addictive. So, the ribbon close is a great idea to add. :D Happy Holidays to you, darlin'! they look so great! 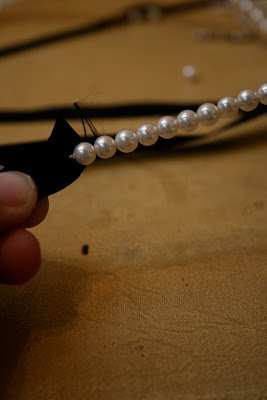 a velvet ribbon would be gorgeous i think... but i don't know why i can't bring myself to wear a string of pearl round my neck, i just feel wayyy to dressed up for going out. 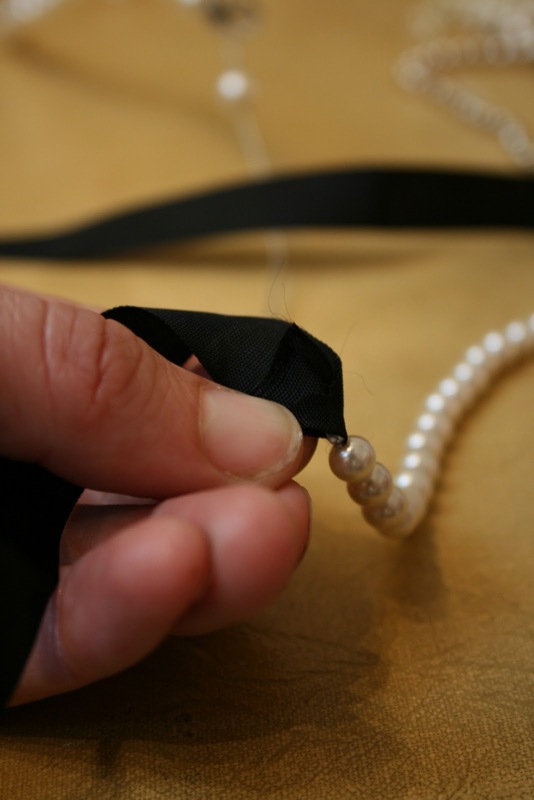 BB - I'm supposed to be decorating the xmas tree, cleaning house and wrapping presents...but I think I might just bag all that to string the broken strand of pearls I found in my mother's belongings when she died last year. Like so many relationships, this one was complex. 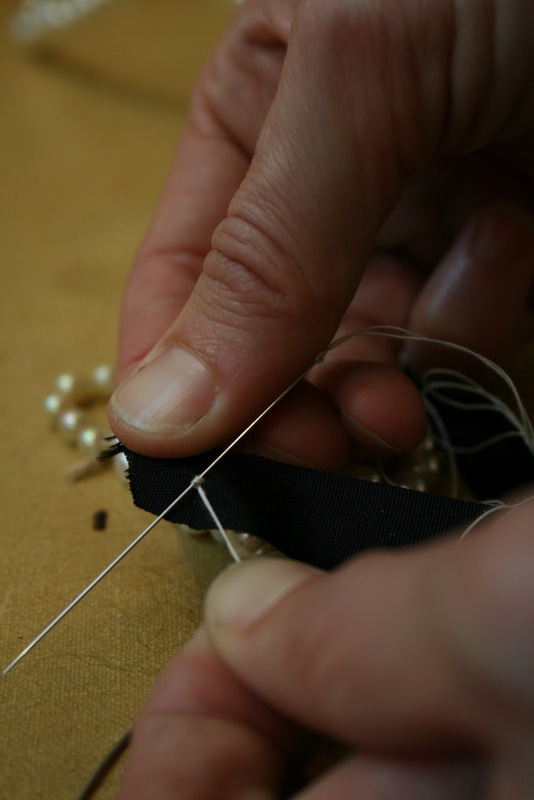 What a lovely way to restring a broken piece...in so many ways. Thank for this Christmas miracle. wow - I totally dig those pearls with the ribbon. thank you!